The human eye captures images on its retina. But what we "see"—form, detail, color, depth, contrast, and so on—is a result of how the brain receives and rebuilds the signals from the retina. In the 1960s and 1970s, the pioneering studies of Torsten Wiesel (1924 - ) and David Hubel (1926- ) revealed the pattern of organization of brain cells that process vision and how this organization relates to function. They also discovered how connections between nerve cells filter and transform sensory information on its way from the retina to the cerebral cortex, and how the cortex changes during development in response to experience. In 1981 Wiesel and Hubel received the Nobel Prize "for their discoveries concerning the visual system," shared with Roger W. Sperry. An experiment published in 1959 launched Wiesel and Hubel's collaboration of more than 20 years. Using a then-new electrophysiological technique of recording the activity of single brain cells in cats, they found in this and later studies that some cortical cells respond to contours of specific orientation. Further experiments in cats and monkeys led to the discovery of ocular dominance, the preference of cells that process visual stimuli to respond to input from one or the other eye. Then, knowing that children born with cataracts did not develop normal vision after removal of the cataracts, they did a series of experiments to understand what happens to the brain's visual processing system when one eye was occluded by closing the lid. Wiesel and Hubel found that when an animal lacked vision in one eye during a critical early period of development, cells in the brain's primary visual cortex expanded into the areas that normally would have received signals from that eye. This research showed that early in life there is a brief span of time during which the neural connections present at birth can be lost or modified if they are deprived of stimuli. Improved therapies for children born with cataracts, which must be removed within about a week of birth for vision to develop normally, or with other vision problems such as strabismus, were a direct result of Wiesel and Hubel's findings. Beyond such practical applications, their work opened the field of the modern study of the cerebral cortex—the brain area responsible for thought, reasoning, and memory—and laid the foundation for research on all sensory systems. In another long-term collaboration Wiesel worked on the detailed neural circuitry of the visual cortex with Rockefeller neurobiologist Charles Gilbert, research that revealed horizontal connections that have since been found in other cortical regions as well. Torsten Wiesel joined the faculty of Rockefeller University in 1983 and served as president of the university from 1991 to 1998. After retiring as president, Wiesel turned his attention to international science advocacy. From 2000 to 2009, he served as secretary general of the Human Frontier Science Program, established to support international, innovative and interdisciplinary basic research in the life sciences. He was chairman of the Board of Governors of the New York Academy of Sciences from 2000 to 2006. Wiesel has long served as chair of the scientific advisory committee of the Pew Scholars Program. He also helped initiate its Latin American Fellows Program in the Biomedical Sciences, which provides support for Latin American researchers for postdoctoral training in the United States. He is a founding member of the Israeli-Palestinian Science Organization, a nonprofit alliance established in 2004 to support collaborative research between scientists to promote positive interactions between the two communities. He is the co-chair of the Board of Governors of the Okinawa Institute for Science and Technology (OIST) and currently serves on the scientific advisory boards of research institutes in Japan, China, India, Brazil, and Italy. 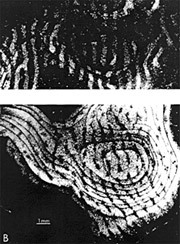 In a dark field autoradiograph of striate cortex in a normal monkey (top), the labeled columns from one eye are white; those from the other eye are dark. The image at bottom shows how the columns of the open eye (white) have expanded as the columns of the eye deprived of light (black) have shrunk. Wiesel received his medical degree from the Karolinska Institute in Stockholm (1954), and then taught in the Institute's department of physiology and worked in the child psychiatry unit of the Karolinska Hospital. He began a fellowship in ophthalmology at Johns Hopkins University Medical School in 1955 and became an assistant professor there in 1958. The following year he became an instructor in pharmacology at Harvard Medical School, beginning a 24-year career with the university; he became professor in the new department of neurobiology in 1968 and its chair in 1971. Wiesel came to Rockefeller in 1983 as Vincent and Brooke Astor Professor and head of the Laboratory of Neurobiology. During his term as president, he recruited 16 new faculty members, established six interdisciplinary research centers, and formed the University's collaborative relationship with the Aaron Diamond AIDS Research Center, of which he was chairman. He is currently emeritus at Rockefeller and a visiting professor at the Karolinska Institute, and shares his time between New York and Stockholm. Wiesel continues to be active as a global human rights advocate. He is a founding member of the International Human Rights Network of Academies and Scholarly Societies. He served for 10 years as chair of the committee on human rights of the U.S. National Academy of Sciences, and in recognition of this important work was awarded the David Rall Medal from the Institute of Medicine in 2005. In addition to the Nobel Prize, Wiesel has received the National Medal of Science (2005), the Dr. Jules C. Stein Award presented by the Trustees for Research to Prevent Blindness, the Ledlie Prize from Harvard, Columbia University's Louisa Gross Horwitz Prize (1978), the Gerard Prize of the Society for Neuroscience, the Scientific Achievement Award from the National Eye Institute, and the Helen Keller Prize for Vision Research. He is an elected member of the U.S. National Academy of Sciences (1980) and its Institute of Medicine. Wiesel also is a member of the American Philosophical Society, the American Academy of Arts and Sciences, the New York Academy of Medicine, and the Royal Swedish Academy of Sciences.